In the 70s and 80s, a strict intolerance for the racist abuse of science mushroomed into something entirely different: an ideological rejection of the notion that genetics played any role in human behavior. This school of thought was so dominant that many scientists were frightened away from any research remotely related to such matters. But you can’t deny reality. As one scientist wrote, “Evolution didn’t stop at the neck.” Human mental evolution was strongly influenced by selection pressures, which manifested themselves in human behavior. Genetics really does influence behavior, but it took a while for scientists to re-assert that basic principle. Two scientists, Cosmides and Tooby, began an extremely rigorous program of experiments that demonstrated beyond question that there were oddities of human cognition that could not be explained by any environmental factors. They christened their field of research “evolutionary psychology”. For many years they attracted considerable opprobrium, but their research was flawless and now evolutionary psychology is a respected field of research. The eminent scientist E.O.Wilson was the world’s leading authority on the behavior of ants when, in the 1970s, he proposed that evolutionary selection pressures acted on behavior as well as the body, leading to genetic factors in behavior. His work with ants demonstrated the basic concept beyond question, but when he extended his ideas to humans, he triggered a shitstorm of outrage, and was treated quite badly. Wilson’s work was impeccable, but because it was distantly analogous to the racist IQ claims, his ideas (which he termed “sociobiology”) were lumped together with that odious ideology. As I’ve pointed out before, Pinker’s “big bang” fairy tale can be easily debunked by anyone who takes the trouble to read Man and Aggression, edited by Ashley Montagu, which appeared in 1968. A manifesto of the Blank Slaters, the last I looked it was available on Amazon for a mere 46 cents. It documents the fact that there were several thinkers who insisted on the existence of innate human nature long before Wilson, including Nobel Prize winner Konrad Lorenz, and that they also had the honor of being denounced as fascists and racists by the politically pure. According to the testimony of the Blank Slaters themselves, however, by far the most prominent among them was not Lorenz but Robert Ardrey, a “mere playwright.” That fact goes far to explain Pinker’s fabrication, which spares the sensitivities and gravitas of his academic tribe. Read Ardrey’s books, along with those of Lorenz and several others who were challenging the prevailing orthodoxy during the 60’s, and it will become abundantly clear that, as far as the overriding theme of innate human nature is concerned, Sociobiology was anything but original. Human biodiversity is an acknowledgment that humans differ from each other in various ways because of our different genotypes. Differences include, but are not limited to, physical appearance, athletic ability, personality, and cognitive abilities. However, riding on the coattails of this respectable (evolutionary psychology) work is the HBD movement, populated mostly by eager amateurs rather than professional scientists. The HBD movement covers a broad range of ideas, from the genuinely scientific to the nakedly racist. At the scientific end of the range we have people like HBD Chick, who aggregate lots of evidence on matters anthropological and genetic as they relate to human behavior. At the other extreme we have Steve Sailor (sic), a conservative who promulgates racist ideas. There’s an easy way to differentiate the scientific side of HBD from the racist side: fixation on IQ. These people love to wring the IQ data for every ounce of scientific justification they can find for their racism. They analyze IQ scores by race, religion, gender, national origin, and lots of other factors; I wouldn’t be surprised if one of them hasn’t calculated the correlation coefficient of IQ score with aversion to broccoli. They triumphantly trumpet the results that support their prejudices and quietly ignore results that undermine their prejudices, such as the finding that national IQ scores are correlated with GDP per capita. Finally, I caution the reader to subordinate personal preference for scientific objectivity in this question. I fervently believe that “All men are created equal”, but I am willing to entertain the hypothesis that some men are born with lesser cognitive talents than others. If solid evidence arises that blacks are cognitively less capable than whites, then I shall accept the hypothesis and move on to asking how we reconcile scientific conclusions with political theory. So far, however, the evidence I have seen is completely inadequate to support the hypothesis. 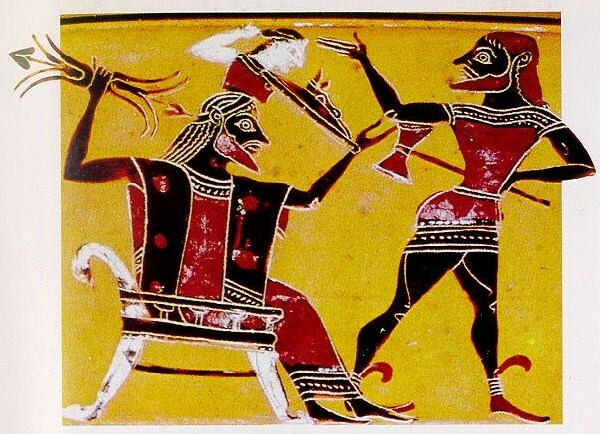 Ancient Greek artwork depicting Evolutionary Psychology emerging fully formed from the head of E. O. Wilson. Headline: Candidate Embarrassing Byline: Stiff as a board, clueless, artificial. Republican Presidential candidate exposed many of his weaknesses on his European tour. Headline: Romney Enrages Palestinians (have they ever not been enraged?) Byline: Romney campaigns on his foreign tour – and arouses the Palestinians against him in the process. Headline: Romney’s Blundering Tour through Europe Byline: The U.S. candidate for President booked a week of blunders and slip-ups in Europe. Things just aren’t going right for the Republican. Headline: Stepping in it On Tour Byline: The Palestinians accuse him of racism, the British are cross, and Polands Solidarnosc doesn’t like him. Headline: Romney Advisor Curses Reporters in Warsaw Byline: There’s no end to the criticism directed at Romney’s foreign tour – now one of his advisors lost his cool. And mind you, that’s just what I saw in a quick glance on a single day. Actually, it’s a huge improvement. Back in the last years of the Clinton and first years of the Bush Administrations, Der Spiegel’s website was so full of vile, quasi-racist anti-American rants that it was often difficult to wade through it all and find any news about Germany. They only gave it up when a few people across the pond started to notice, and the editors realized they were putting all those prestigious international prizes for “objective journalism” in jeopardy. They still occasionally throw out some red meat to the Amerika haters, but only enough to keep them on life support. …we found that employed husbands in traditional and neo-traditional marriages, compared to those in modern marriages, tend to (a) view the presence of women in the workplace unfavorably, (b) perceive that organizations with higher numbers of female employees are operating less smoothly, (c) find organizations with female leaders as relatively unattractive, and (d) deny, more frequently, qualified female employees opportunities for promotion. We believe that the results of these studies are important to understanding the stalled gender revolution as well as to theorizing about the effects of marriage structures in the workplace and, more pragmatically, effectively targeting efforts aimed at enhancing gender equality in work organizations. On the face of it, this appears to be a statement of “is” rather than a statement of “ought.” In other words, if the authors are correct, they have simply stated facts, not necessarily loaded with an accompanying moral judgment. I think most readers of the paper will agree that the moral judgment is certainly there, but let’s ignore that for the moment. Is proposing such hypotheses, and then presenting data to support them “good” or “not good?” Well, as readers of my blog are aware, while I do have a distinct weakness for making moral judgments myself, I don’t flatter myself that I have any objective basis for doing so. I can, however, point out that there is a consensus in some human societies that similar statements about various groups regarding characteristics over which they have no control, such as race, gender, ethnicity, etc., are considered evil. For example, academic papers presenting data, no matter how convincing, that certain races are more intelligent than others, or that certain ethnic groups are more greedy or lazy than others, or even that some subclass of females are similarly “harmful,” would likely be greeted with a storm of protest. This begs the question of why such discrimination applied to men is OK. It would seem that what we have here is a classic double standard. Numerous similar double standards exist in modern societies, often due to the long resistance to recognizing commonalities in human behavior, or “human nature.” Classification of other human beings into ingroups and outgroups, or what was once referred to as the Amity/Enmity Complex, is one such commonality. It is the ultimate cause of many of the negative consequences we associate with various forms of discrimination. However, because we have refused to recognize that ultimate cause, it has been necessary for us to separately identify each negative outcome of that behavior after a long, slow learning process, instead of immediately recognizing the psychological basis of them all. For example, anti-Semitism was not considered a serious moral fault until the discovery of mounds of corpses in the Nazi death camps. Racism was similarly acceptable until the social evils arising from it were clearly recognized. It would seem, based on the evidence of this paper, that sexism directed at men has not yet been recognized as another of the undesirable manifestations of ingroup/outgroup discrimination. Therefore, we do not intend to, nor are we pointing a finger at those whom we have claimed constitute a pocket of resistance to the gender revolution. Some may be characterized as “benevolent sexists” (e.g., Glick & Fiske, 1996) and others may be neither benevolent nor hostile sexists. We do not want to label, we also do not want to ignore a real problem. Clearly, organizations should not seek to control the marital status of their male employees, for example, by means of selection. To do so would be unjust, likely illegal, and perhaps, bad business. No, organizations should not seek to manipulate people’s non-work lives; but we, as organizational scholars, should seek to understand better how the byproduct of those non-work lives can be accommodated in the workplace. We have found that employed husbands in traditional and neo-traditional marriages, compared to those in modern marriages, tend to deny, more frequently, qualified female employees opportunities for promotion. …employed husbands embedded in traditional (wife not employed) and neo-traditional (wife employed part-time) marriages compared to those embedded in more modern ones (wife employed full-time) are more likely to exhibit attitudes, beliefs, and behaviors harmful to women in the workplace. We believe that the results of these studies are important to understanding the stalled gender revolution as well as to theorizing about the effects of marriage structures in the workplace and, more pragmatically, effectively targeting efforts aimed at enhancing gender equality in work organizations. One wonders what “targeting efforts aimed at enhancing gender equality in work organizations” could possibly consist of if it didn’t somehow imply condemnation of men in “traditional” marriages. Are we to believe that there is really no better way to promote gender equality than by denouncing a large subgroup of men, whether implicitly, and, as the Germans say, “through the flower,” or not? The promotion of new forms of sexism seems a counterintuitive way to promote gender equality.